The Spirit<sup></sup> E-310 Classic LP Gas Grill has generous cooking space, along with consistent and superior temperature control - all rolled up into an affordable gas grill package. The E-310 classic features Weber's Gourmet System cast iron cooking grates and 32,000 BTUs of grilling power. Assembly required. Includes the Weber Gourmet BBQ System porcelain coated cast iron griddle  its perfect for barbecuing smaller items and is great for a fry up! Includes a 25-year warranty on aluminum castings and porcelain lid, a 10-year warranty on the stainless steel burners. Also comes with a 5-year warranty rust through or burn through on cast iron cooking grate and 2 years on all remaining parts and paint. The GS4 High Performance Grilling System sets a new standard in the world of backyard cuisine, and lands the Genesis II and Genesis II LX series of gas grills in a class of their own. Each component of GS4 was uniquely designed for ease-of-use and to provide an unequalled satisfaction to your backyard grilling experience. The GS4 grilling system is composed of four key components: The Electronic Ignition, High Performance Burners, and Flavorizer Bars. These components ensure that every aspect of your grilling experience is easy and reliable, from the moment the burners are lit to the general maintenance of your grill. And together, create the strongest grilling engine within every Genesis II and Genesis II LX grill. The GS4 High Performance Grilling System sets a new standard in the world of backyard cuisine, and lands the Genesis II and Genesis II LX series of gas grills in a class of their own. Each component of GS4 was uniquely designed for ease-of-use and to provide an unequalled satisfaction to your backyard grilling experience. The GS4 grilling system is composed of four key components: The Electronic Ignition, High Performance Burners, Flavorizer Bars, and Grease Management System. These components ensure that every aspect of your grilling experience is easy and reliable, from the moment the burners are lit to the general maintenance of your grill. And together, create the strongest grilling engine within every Genesis II and Genesis II LX grill. The GS4 High Performance Grilling System sets a new standard in the world of backyard cuisine, and lands the Genesis II and Genesis II LX series of gas grills in a class of their own. This innovative grilling system is based on over 30 years of grilling experience, culinary expertise, and most importantly, avidly considering the wants and needs of the people who matter most: the grilling community. Each component of GS4 was uniquely designed for ease-of-use and to provide an unequalled satisfaction to your backyard grilling experience. Promising burners that are ensured to ignite every time, smoke infused food that grills evenly and consistently regardless of where its placed on the cooking grate, and hassle free cleanup, you are able to focus on what its is all about: bringing people together around the grill. The GS4 grilling system is composed of four key components: The Electronic Ignition, High Performance Burners, Flavorizer Bars, and Grease Management System. Spirit E-310 Classic Liquid Propane BBQ The Spirit<sup></sup> E-310 Classic LP Gas Grill has generous cooking space, along with consistent and superior temperature control - all rolled up into an affordable gas grill package. 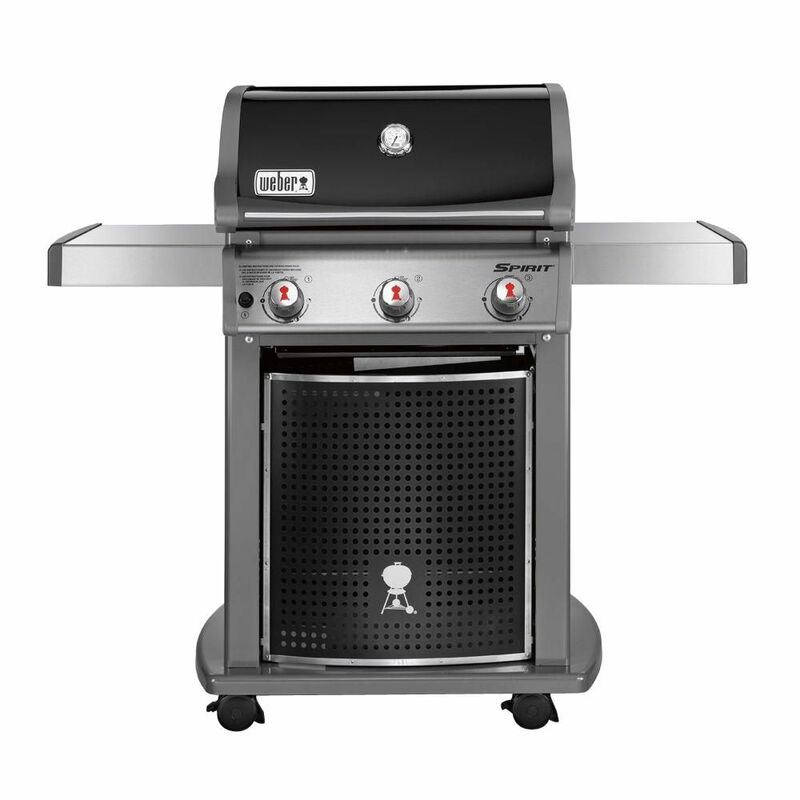 The E-310 classic features Weber's Gourmet System cast iron cooking grates and 32,000 BTUs of grilling power. Assembly required. Spirit E-310 Classic Liquid Propane BBQ is rated 4.4 out of 5 by 283. Rated 2 out of 5 by Ralph from terrible product. I had a charbroil that was much better. terrible product. I had a charbroil that was much better. Rated 1 out of 5 by Jule from I'm extremely disappointed that this product is no longer functioning. After about 6 months, I w... I'm extremely disappointed that this product is no longer functioning. After about 6 months, I was not able get the grill to heat up. And the heat / gas controls became warped/stripped and also no longer functioning. I was no longer able to control the temperature or get the grill to heat up past 250 degrees. now I have no way of returning or exchanging it. Rated 3 out of 5 by Casey from Average Disappointed to find the Weber wasn't better than many other cheap grills. Parts started to wear out after 4 years but more importantly it is underpowered. There are not enough BTUs to get this rig over 500 degrees which is required to get a real seat on meats. Rated 5 out of 5 by David from So far so good it works great. I was... So far so good it works great. I was missing the match holder when I got the grill home so I called Weber and they sent one out the next day that his customer service thank you so much. Rated 2 out of 5 by twh4206 from What sold me on the free assembled grill was the 'grate' design- allowing the fry/wok pan to be i... What sold me on the free assembled grill was the 'grate' design- allowing the fry/wok pan to be inserted into cooking area, This is a great idea for cooking veggies and shrimp, etc., but after I got home with grill I realized how cheap the frame was made. The front had a plastic cover I didn't really pay attention of that at original review. The metal top was as thin as tin foil and had some minor dents in it. The grill was unstable with the cheap frame so I returned it to Home Depot. Nice grate/cooking area 'idea' - cheaply made. How bout having something quality work- made in the good ol USA for a change? Rated 5 out of 5 by HomeDepotCustomer from We love it! Just the right size and easy to assemble and maintain. Good job Weber. We love it! Just the right size and easy to assemble and maintain. Good job Weber. Rated 5 out of 5 by GrillainManilla from High quality as advertised This is a solid, high quality grill so far (2 weeks of use). While it is expensive for the features, the promise of Weber willing to make right any issues encountered makes it worth the price tag as a long term investment. Is this model propane-do the sides fold down. Hello Herb! Yes, this is a propane model. The side tables are fixed in the upright position. Thanks! Hi Cableguy! Please reach out to your local Home Depot store for information pertaining to delivery and shipping options. Thanks!